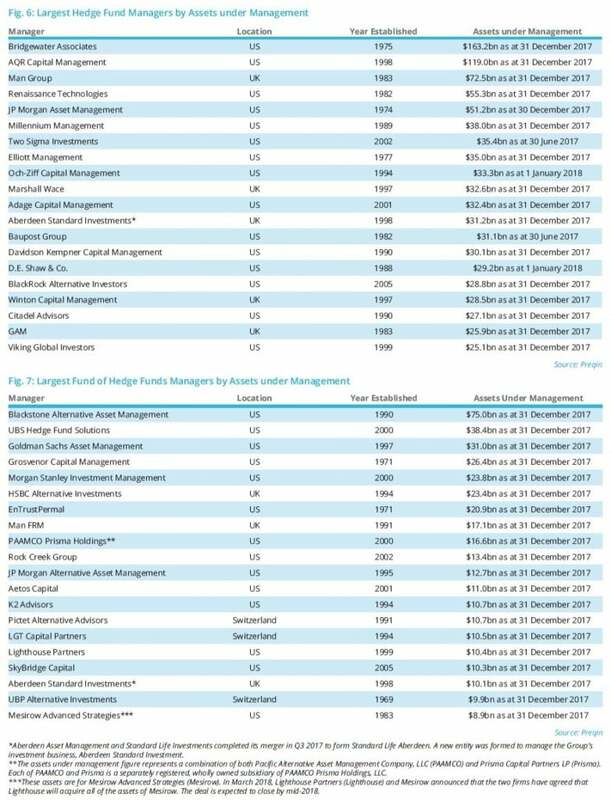 Hedge funds have struggled to navigate the challenging market conditions seen at the start of 2018. 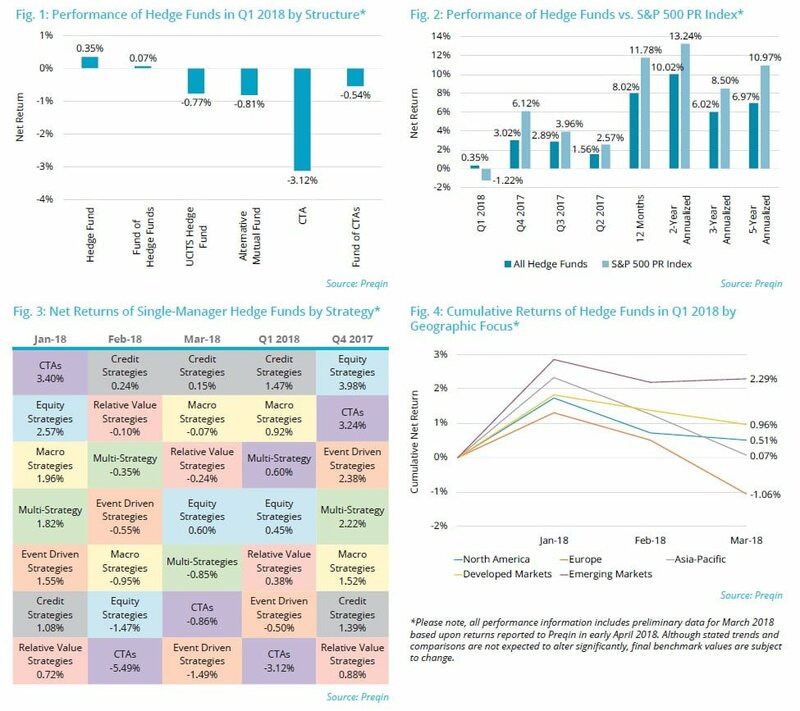 Despite this, the strong start to the year, which saw the Preqin All-Strategies Hedge Fund benchmark return 1.92% in January, was enough to keep hedge funds in the black for Q1 2018: the benchmark finished on 0.35% following negative returns in February and March (-0.92% and -0.63% respectively, Fig. 1). Only credit strategies generated positive returns in February and March, with all other leading hedge fund strategies posting losses. 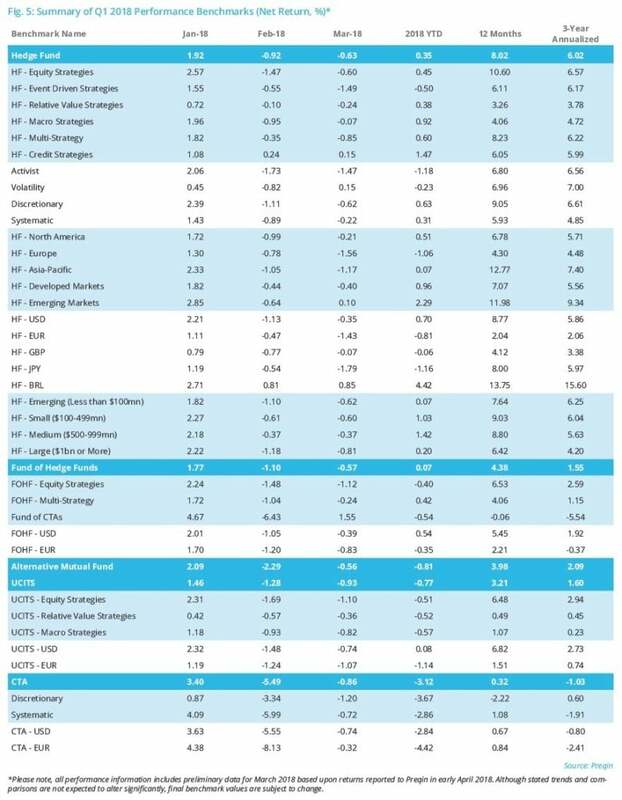 However, similar to the Preqin All-Strategies Hedge Fund benchmark, most top-level strategies posted positive returns in Q1 2018 as a result of strong January performance. However, CTAs and event driven strategies suffered losses over the quarter (Fig. 3). In the case of CTAs, huge swings in Q1 led to a quarterly net loss of 3.12%, almost entirely wiping out the gain of 3.24% recorded in Q4 2017. On a regional basis, hedge funds with a focus on emerging markets reported the highest returns in the quarter (+2.29%, Fig. 4). This strong performance built on the success of 2017, with the emerging markets benchmark outperforming all other top-level regional benchmarks, except for Asia-Pacific, over 12 months. The only top-level benchmark to post negative returns in Q1 2018 was Europe (-1.06%). 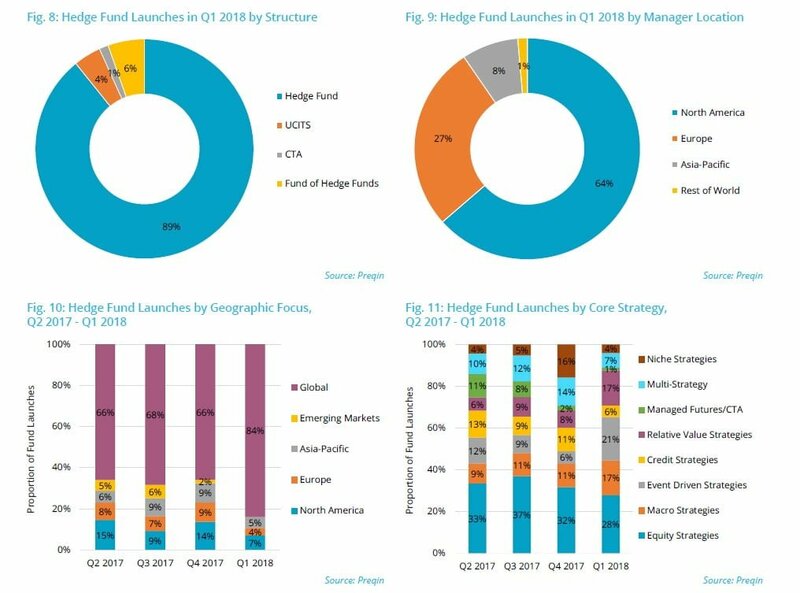 There were 74 hedge fund launches in Q1 2018, of which single-manager hedge funds represented the majority (89%, Fig. 8). Nearly two-thirds (64%) of new funds launched in Q1 2018 are managed by North America-based fund managers (Fig. 9). The proportion of total fund launches accounted for by managers in North America has fallen by four percentage points in comparison with Q1 2017. In contrast, Europe’s share of fund launches has grown over this period, from 16% of launches in Q1 2017 to 27% in Q1 2018. In comparison with recent quarters, there has been a significant growth in the proportion of funds launched pursuing a global investment strategy (84% in Q1 2018, Fig. 10). This indicates that, with volatility increasing across many markets globally, hedge fund managers are launching new funds to exploit opportunities on a macro scale. The proportion of hedge funds launched in Q1 2018 that employ an equity strategy fell for a second consecutive quarter to 28% (Fig. 11). This may indicate that fund managers’ outlook for equity strategies aligns with the views of many investors: Preqin’s recent survey of investors revealed that 45% believe we are at the peak of the equity cycle. There has been a significant uptick in the proportion of launches represented by event driven strategies and relative value strategies vehicles in Q1 2018, the proportion (21%) of all funds launched that pursue an event driven strategy is at its highest level since Q3 2016. In Q1 2018, there were 177 new hedge fund searches issued by investors on Preqin’s online platform. The largest proportion (41%) of investors issuing fund searches were based in Europe, followed by North America with 32% (Fig. 12). The largest proportion (52%) of investors initiating searches in Q1 2018 included long/short equity as part of their mandate, continuing a trend seen in previous quarters (Fig. 13). Thirty percent of fund searches include multi-strategy funds which, having posted 22 consecutive months of positive returns dating back to March 2016, were the second best performing top-level strategy in 2017. However, this run of positive performance ended in February, with a loss of 0.35% (see page 3). Macro strategies are also highly sought by investors, highlighting the continued appetite for these strategies, which are able to provide some downside protection in the event of a market correction. Ninety-two percent of searches initiated in Q1 2018 included a direct investment – in contrast, just 16% of searches were for funds of hedge funds. The majority (90%) of fund searches issued in Q1 included commingled funds; however, there remains strong appetite for UCITS products (20% of searches) and managed accounts (10%, Fig. 14). As seen in Fig. 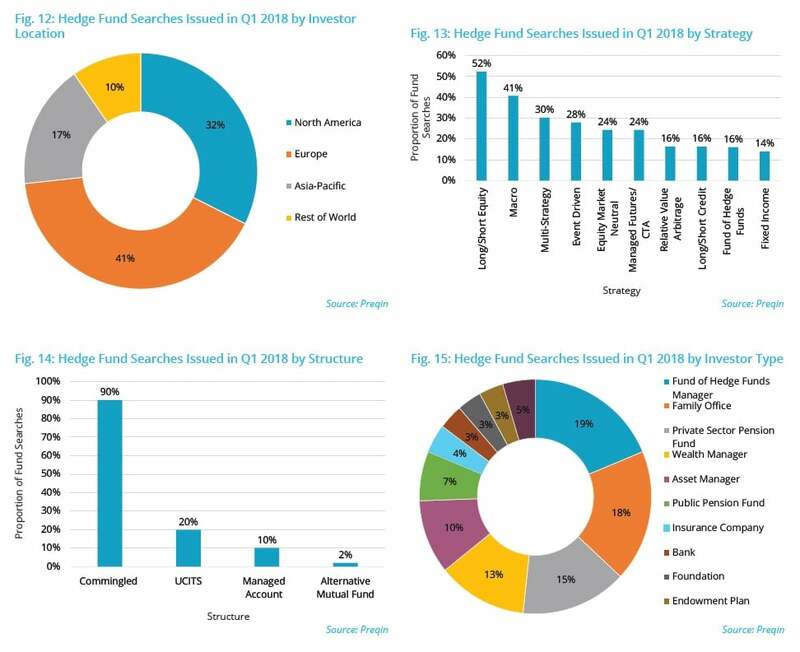 15, the greatest proportion (19%) of fund searches issued in Q1 2018 were issued by fund of hedge funds managers. Private wealth firms remain an important source of capital, with family offices and wealth managers collectively accounting for almost a third (31%) of all fund searches.